Synopsis: On Baker Street in December of 1885, the Doctor introduces Ori to the joys of Christmas in Victorian London, but the two find there is little hope for peace on Earth. A brutal murder has struck down a member of Parliament, Sir Reginald Carruthers, and the Doctor’s investigation into the circumstances surrounding the high profile killing uncovers more extraordinary crimes. The dead man was involved in a black market connecting Marylebone and Limehouse, an underground network trafficking otherworldly artefacts to London’s elite. Another of the buyers, the eccentric Colonel Malcolm Fraser, believes these dangerous and powerful objects support his outlandish theories concerning the lost city of Atlantis. 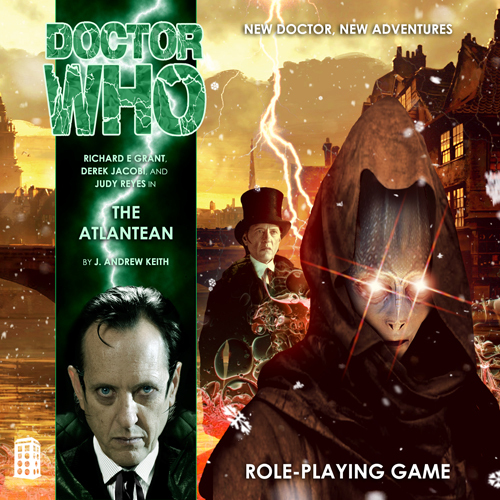 What’s more, he claims the artefacts have led him to make contact with an Atlantean! The Doctor is sceptical of Fraser’s fantastic story until he chases down a cloaked, ethereal figure in a snow-strewn alley—a herald angel, a ghost of things to come. Recognizing this ghastly creature for what it truly is, he realizes that the truth of these events is more terrible and frightening than the likes of Carruthers or Fraser could ever have suspected. The course of human history is being threatened by the introduction of anachronistic alien artefacts, but there are those who will make every effort to ensure that mankind is not diverted from its predestined path. None are more invested in preserving the history of humankind than the Divinity. After all, it is a history that they have spent millennia remaking in their image.